Surprisingly, this is my first time making chilli. Ever. I'm just not a chilli kind of girl really. But I needed a recipe that I could easily prep ahead of time and easily assemble on a weeknight with friends coming over for dinner. A one-pot dish was the answer, and with the blustery winter days upon us, I thought that a big pot of chilli would make for a casual, comforting weeknight dinner. I made the chilli with ground turkey, a leaner choice of meat, to make it heartier, but you can easily leave it out for a vegetarian version (and it will be just as delicious!). 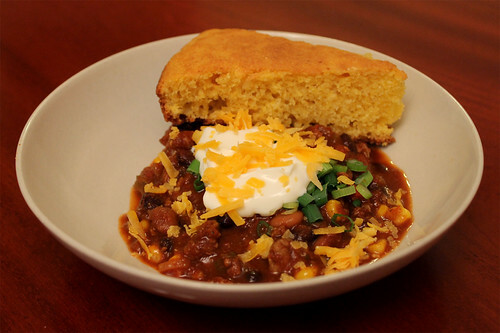 Make a big pot the night before and simply reheat it while you whip up a batch of cornbread. And best of all, the leftovers taste great (if not better as you let the flavours intensify) the next day! Heat the oil in a large dutch oven over medium-high heat until just before it begins to smoke. Add the ground turkey and cook until there's some colour on the meat and mostly cooked through. Add the onion and cook until translucent and slightly softened, about 3 minutes. Add the red and green bell pepper and and cook for 3 minutes. Add the garlic and cook until fragrant, about 1 minute. Sprinkle in the cumin, ancho chilli powder and cayenne pepper and stir to coat. Cook until fragrant, about 1 minute. Add 1 3/4 cups of the stock or water and stir well to combine, scraping up any browned bits from the bottom of the pot. Bring to a boil, reduce the heat, and simmer, uncovered, until slightly thickened, about 5 minutes. Stir in the crushed tomatoes, oregano, and brown sugar, and bring back to a simmer. Simmer until slightly thickened, about 20 minutes. Add the beans and the corn and stir gently to incorporate. Cook until the beans are heated through and the corn is completely defrosted, about 5 minutes. Remove the pot from the heat and serve individual bowls topped with shredded cheddar cheese, a dollop of sour cream, and some green onions, if desired. Enjoy with a warm slice of cornbread! 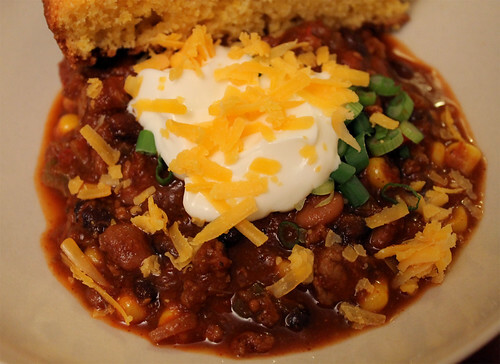 * Or you can use regular chilli powder, but you won't get the same smokey flavour that the ancho version will lend it. ** I used a mix of cranberry/romano, white kidney and pinto beans, but use whatever beans you like. To cook the beans, soak the beans overnight in cold water. The next day, bring beans and salted water to a boil and simmer for 40 to 50 minutes, or until tender. Alternatively, you can do a quick-soak by bringing dried beans and water to a boil, then let simmer for about 3 minutes. Turn off heat, cover, and let the beans sit in the boiling water for an hour. Drain, rinse, and then cook beans as directed above. Suzanne Gardner January 20, 2012 at 8:53 p.m.